Since its launch last semester, Cap Cupboard has grown to be a valuable resource on campus. Cap Cupboard has begun to accept items other than food, including hygiene products, toiletry items, and feminine products. The cupboard also now has leftover dishes from Aramark, donated by Aladdin so that students have bowls and plates to use. Bags for Break, an initiative started over winter break, gives students packages for break when things like the Main Dining Room (MDR) are closed. They were offered again over spring break, and will be available to students for Easter break as well. So far, about 45 bags have been given out. 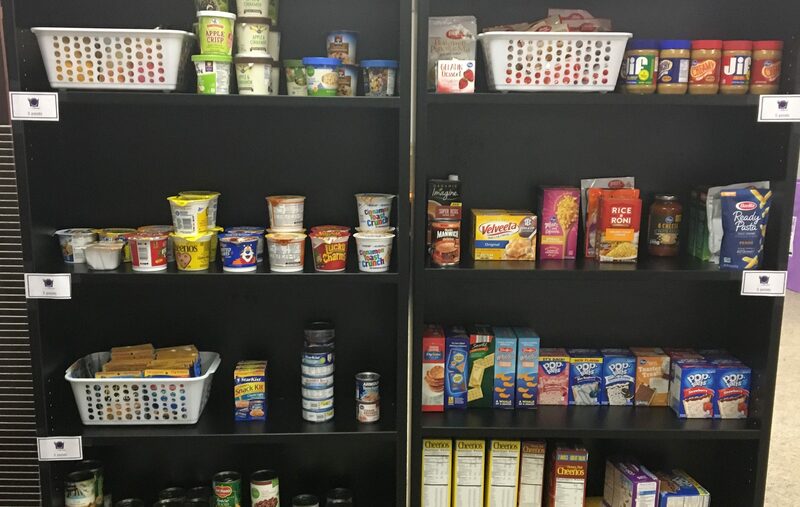 A view of the items that Cap Cupboard keeps stocked for students, free of charge. In addition to the Bags for Break, the Cap Cupboard has also started to offer weekend bags, which are similar to the break bags, just with smaller quantities. Students can pick up a weekend bag starting Thursdays. The Cap Cupboard has had approximately 160 visits just this semester, which has grown from approximately 120 visits in the fall semester. “Students have been utilizing it more and more, which is great,” Abbey Rutschilling, program coordinator for the Office of Student Community and Engagement (SCE), said. Looking forward to the cupboard’s future, Rutschilling said that there are exciting things in store. Next year, a social work student will use the cupboard for their field experience. For 16 hours every week, this student will work to advocate the cupboard and partner with other organizations to help it continue to grow. “[We want] the Cap Cupboard to grow into a resource center so students can go there and get some food, but also connect to resources in the community as well,” Rutschilling said. If you can’t volunteer, that does not mean that you can’t help. Cap Cupboard is always looking for more donations, especially now with Easter break coming up. The items the cupboard is mostly looking for include tuna, crackers, peanut butter, granola bars, fruit cups, applesauce, easy mac, mac and cheese, pasta, and pasta sauce. You can drop off these items to the SCE office.